Just Say Yes Events: I scream, you scream, we all scream for ice cream! Lily is one very lucky little girl I must say. I had the opportunity to work closely with my good friend Nicole Chibnik from Flour Cake & Pastry for her daughter's 2nd birthday party. Nicole had an ice cream theme in mind and wanted something very pretty and modern. There is so much to talk about for this pint sized birthday that I have added descriptions to the images. We hope you think outside the box and hope we inspire you to plan something special. Please click images to enlarge and all photos are ©Just Say Yes Events! 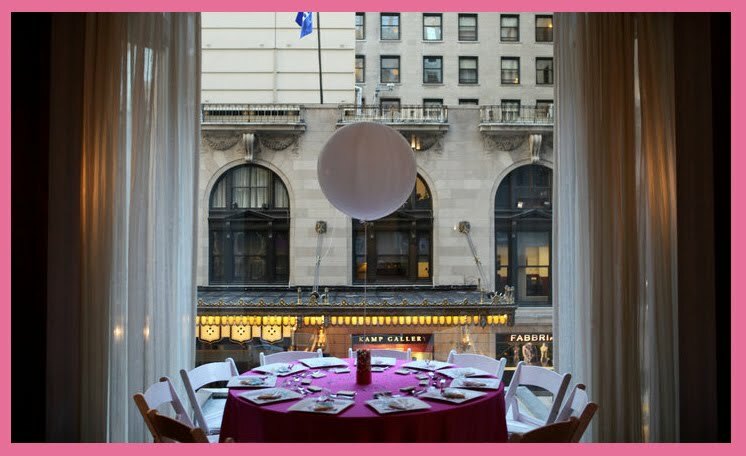 The event was held in a private tenant event space offered by the Palmolive building. On our initial walk through I spied a gorgeous modern round black table in the foyer that had candy buffet written all over it. 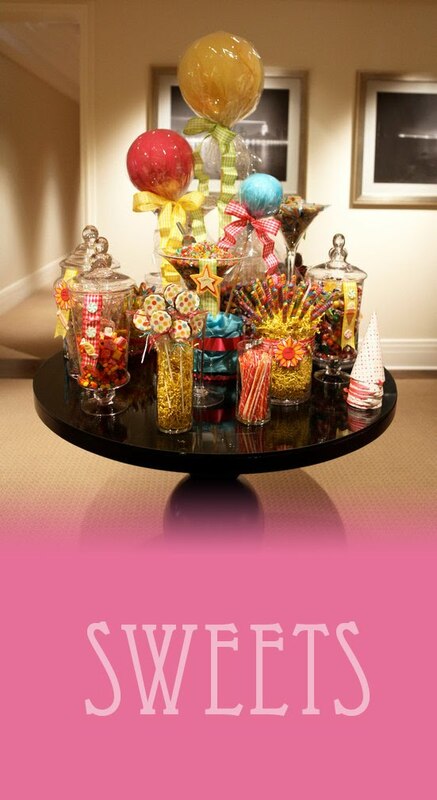 For some time now I have been wanting to design a candy buffet on a round versus the usual banquet size table to try something different. Nicole and I ran all over the city brainstorming together for a centerpiece & candy. When you think of candy buffet you think candy of course so we used GIANT versions of lollipops for the centerpiece and kept all jars glass so the vibrant candy was visible. The candy had to be vibrant so we went with twist lollipops, gumballs, starbursts, pixie sticks, hard candies, skittles & Nicole made custom chocolate lollipops to match the invitation. I think back to when I was a child and this candy buffet would have been absolute heaven. It was a huge hit with both the children and adults but most importantly Lily loved it. Table Design: We kept it very modern, simple & pink of course. The event space is divided into three rooms all in a row with large open doorways. With such a large or should I say long space we knew a very long table would be perfect. Nicole needed to sit at least 30 guests at the main table and an additional two 60" rounds that would seat 8 guests tucked in the windows overlooking the street below. All tables were covered with a bright pink satin linen and all chairs, plates, cups & balloons would be white. While designing this birthday we had a go big or go home attitude and ordered extra large 40" balloons to hover over the main table in a row, which took quite a bit of helium I might add. To hold these down I used a balloon weight tucked into a glass cylinder vase that was then surrounded by gumballs. Nicole being a pastry chef custom made candy bars for every place setting using the graphic that was on the invitation. Instead of place cards each place setting received a personalized ice cream cone cookie with guest name. This was a very simple and modern design but packed some punch with just one main accent color....PINK! 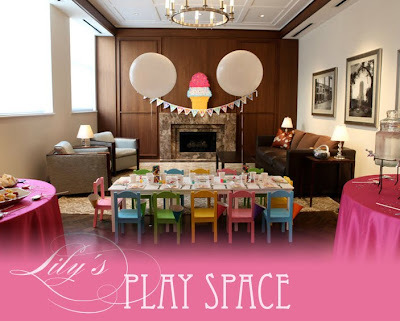 Lily's Play Space: For all those parents who have attended a kid's birthday party, you know it's best that the children have their own area. The venue space had two additional rooms flanking the main space so we utilized one as the play space and the other for the adults food buffet & lounge. Details: *Sigh* Oh how I love details. Nicole is the owner and pastry chef for Flour Cake & Pastry so we knew the cake was taken care of. She out did herself and re-created an exact replica of the ice cream pint invitation. Honestly it was the coolest cake I have seen in a while and so excited that it would be the centerpiece of the main room. To make it just a bit more special Nicole made white chocolate dipped pretzels & sable cookies to compliment the cake. We also brought in taffy apples & french macaroons all in bright colors that we pulled from the invitation. 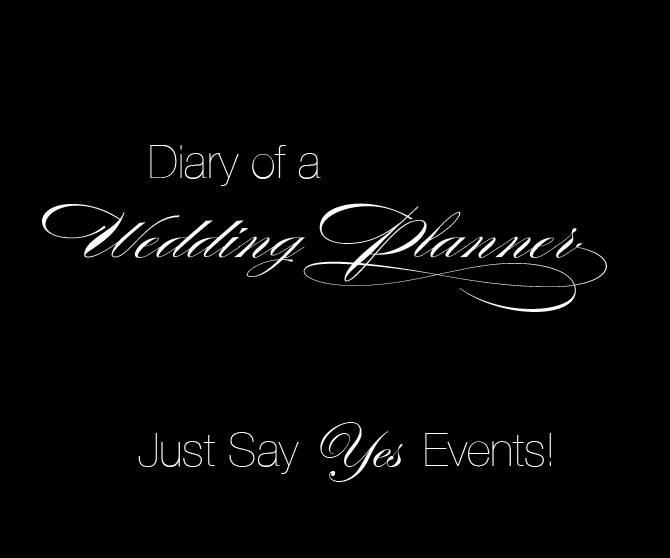 Just Say Yes Events is one of Chicago’s premier event planning firms. Our focus is to assist our clients in bringing their dreams to life by offering creativity, knowledge and expertise. We understand that the success of your event depends upon proper preparation, extreme attention to detail and complete follow through. Each and every one of our events is tailored to your wants and needs. Every client has their own personal style and no two weddings are the same, nor should they be. We offer you peace of mind by providing an experienced consultant in-tune with your desires and concerns to ensure an extraordinary event.